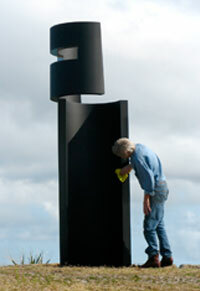 Campbell Robertson-Swann is the director of Defiance Gallery and a celebrated Australian sculptor in his own right. Alongside extensive solo and group exhibitions both locally and overseas, Campbell has devoted himself to furthering the profile and public understanding of sculpture in Australia. Robertson-Swann’s painted and polished stainless steel sculptures have an intense physical authority. Their responsiveness to light and subtle transitions of plane and surface simultaneously negate and heighten their presence. These works have been distilled to a point where the dichotomies of interior/exterior, open/closed and transient/monolithic are brought together, forming spatial illusions that Robertson-Swann deploys as devices within the works. The relationship between the reflective and, conversely, light-absorbent matte surfaces, make the interaction with their surroundings fluid. The architectural motif of the window frames the space around the works and plays with our perception of voids. 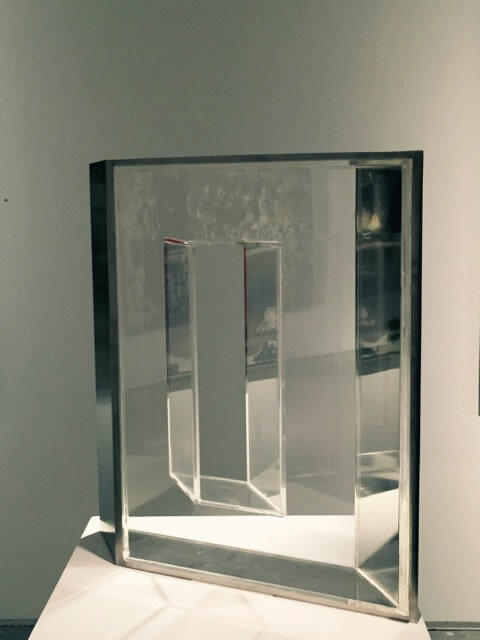 These sculptures force our impression of positive and negative space to vacillate, in an experience Robertson-Swann terms “waltzing with the square”. Indeed, these sculptures inhabit a peripheral realm that one almost has to glance at sideways to catch off guard. In his recent sculptures Campbell Robertson-Swann finds a balance between form and threshold to create liminal spaces. Growing out of a longstanding fascination with architectural structures, such works show a serial trajectory of thought and a rigorous process of reduction. These sculptures are infinitely mysterious and deeply powerful works that belie a subtle complexity through absolute simplicity. The artist's work is held in the collections of Dubbo Regional Gallery, Bathurst Regional Gallery, Connect East in Melbourne, Art Omi in Connecticut USA, Jackson Smith Solicitors in Sydney, Tetsuya's Restaurant, Campbelltown City Art Gallery, Queen Victoria Museum & Art Collection in Launceston, Tasmania and many private collections. He has been a Finalist in the McClelland Survey and Award of 2003 in Melbourne, an Artist-in-residence at Art Omi, Connecticut, USA in 1999 and the winner of ‘Sculpture by the Sea’, Sydney Olympic Arts Festival event in 1998. He has also has undertaken residencies at Knox Grammar School and at the Dunmoochin Foundation, Victoria.